I’ve shared many recipes with you over the years. (PS-Have you visited my Recipes page lately?) In order for a recipe to make it to the blog, it generally has to be one that I liked enough to make again. Keepers, if you will. However, sometimes, those “keepers” get lost in the blogosphere! This is one of them. I first told you about Saucy Mushroom Chicken from Taste of Home back in the Summer of 2010, and somehow I forgot about it until recently. I rediscovered it while browsing around the blog looking for ideas for the upcoming week’s dinner menu. Well, after making it again a few days ago, I am confident that this recipe is worthy of re-blogging! I captured some new pictures as well. Enjoy! The original recipe calls for six 5-oz. chicken breast halves, but for just two of us, I halved the recipe and used about one pound of thin chicken cutlets. First mix together a blend of spices: onion powder, paprika, dried basil, oregano, thyme, salt, and pepper. Set aside half of the spice blend, and then season both sides of the chicken cutlets with the remaining seasoning. 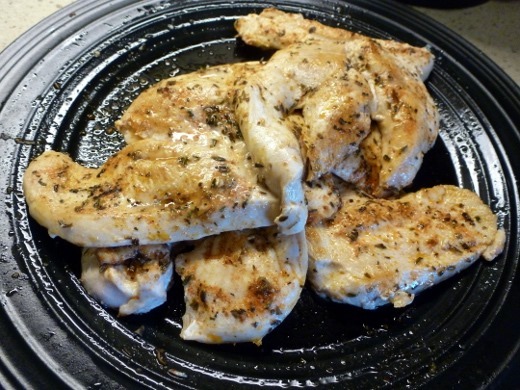 Heat oil in a skillet, then cook the chicken for a few minutes on each side, or until cooked through. Set aside, and cover to keep warm. In addition to initially trying out this recipe a few years ago, I actually made this about three weeks ago, and then AGAIN, for a second time just a few days ago. The second time around, the huz advised me to make sure that I made “plenty of that pimp gravy” while I was preparing dinner. So there ya go. 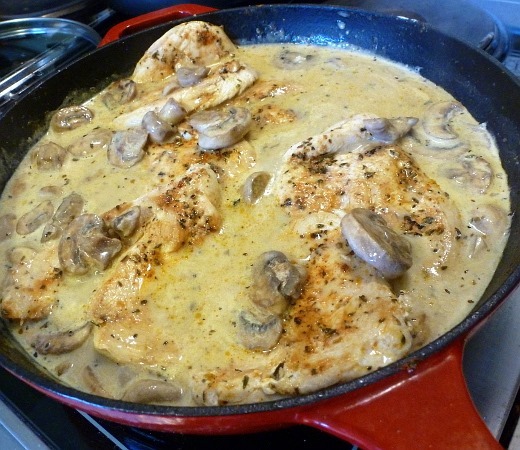 If you like mushrooms at all, you will absolutely love this creamy mushroom sauce. It’s pretty pimp. The sauce is quite simple to prepare. First sauté the mushrooms in oil until soft, and sprinkle with the remaining seasonings. Mix in a spoonful of flour. Slowly pour chicken broth into the pain while stirring (and gently scraping the bottom of the pain to release any remaining browned bits from the chicken and mushrooms), and bring to a boil. Simmer for two minutes, until the sauce has slightly thickened. Now return the cooked chicken to the pan, and heat through. Serving the chicken and creamy mushroom sauce atop mashed potatoes is not optional – it is mandatory. Do it, or the Nom Police will hunt you down. And throw mashed potatoes in your face. Let’s just say it could get pretty ugly. Yukon Golds make THE best mashed potatoes, in my opinion. Just saying. And there you have it! 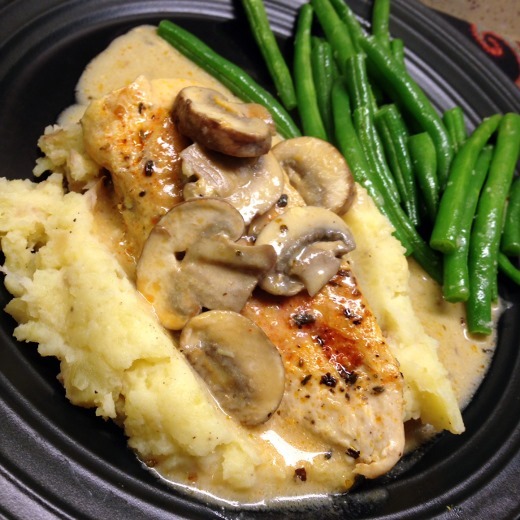 Saucy Mushroom Chicken, resurrected! Totally a KEEPER. Now I hope I don’t wait 4 years to make it again! Flatten chicken to 1/2-in. thickness. In a small bowl, combine the seasonings; sprinkle 1 tablespoons over both sides of chicken. Set aside remaining seasonings. In a large skillet, cook chicken in 1 1/2 teaspoons oil in batches over medium heat for 3-4 minutes on each side or until no longer pink. Remove and keep warm. 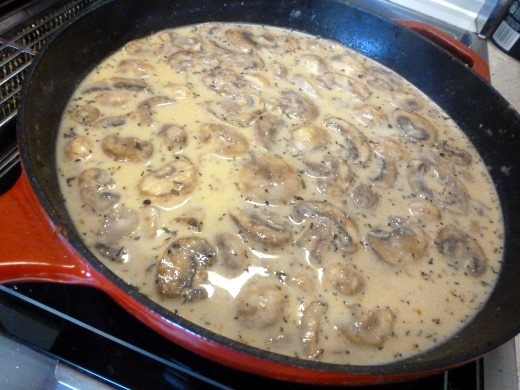 In the same skillet, sauté mushrooms and remaining seasoning mixture in remaining oil until mushrooms are tender. Add garlic; stir 1 minute longer. Stir in flour. Gradually stir in broth and cream. Bring to a boil. Reduce heat; cook and stir for 2 minutes or until thickened. Mmm, it’s so delicious, I bet you’d like it!